How fortunate I was to get the Yellowstone Hook Up, and from a surprise source, no less. Thank you Hill. I was introduced via email to Dan and Joanne Schaub who are working here for the summer. 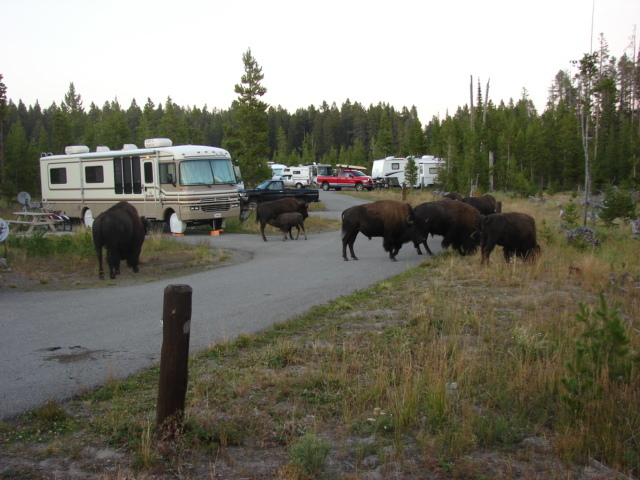 Hearing that I had been having trouble finding camping spots due to the crowds at the National Parks, they said they could hook me up at the Employee RV Park here in Yellowstone, if I was interested. Was I interested? Heck yeah. They set the whole thing up and when I arrived; there was a spot with my name on it for $15 a night, for as long as I wanted. Wow! Can you say what a deal? The site comes with full hook ups which means 50amp electrical service, water, sewer, propane, and my own private Bison herd. (photos to follow). AND as if this weren’t the best already, they offered me the use of their wireless internet at their dorm, which is only about a mile away. I tell you, you can’t beat that with a stick! Thank you, thank you Dan and Joanne! I paid for 5 nights and have been enjoying the Park ever since. Each day I have chosen a different part of the Park to see the sights and hike the hikes and it’s been great. Hot and sunny, well until today that is. We have been having some much needed rain all day. Good Lord, a bull bison the size of Lil Pea just walked by my window and gave me a start. You can’t swing a cat around here without hitting a bison, that’s for sure. Anyway, Dan, Joanne and I had planned to meet this morning at 8:30 and head down to Jenny Lake in the Teton National Park to hike its perimeter, but about half way there the skies grew ominous and Dan’s Doppler Radar app told us to turn around and make a new plan as thunder storms covered the entire area South of us, which included Jenny Lake. So, it was on to Plan B, which included the 4 day old, newly dedicated, Visitor and Education Center at Old Faithful as well as a hike out to the Lone Star Geyser. Since all of us had already seen Old Faithful erupt, we opted for Lone Star instead. ( so don’t get your hopes up for photos of Old Faithful, because there aren’t any…unless you’d like me to dig up my ones from 7 years ago, which I’d be happy to do if anyone feels compelled to see them). We checked out the impressive 22 million dollar Center, found out what time Lone Star was due to erupt and hopped in the car for the short drive over to the trailhead. Once there, we knew we had to hoof it fast if we were going to cover the 2.5 miles before the expected eruption, so we did just that and we’re glad we did, because it had just started to blow immediately prior to our arrival and it blew and it blew and it blew for the 10 minutes or so we were there before an incoming storm sent us packing. It was great to see and there were maybe 4 or 5 other people there at most. Had we been at an Old Faithful eruption, we would have been fighting hundreds for a spot, so this made an especially nice alternative…plus the hike through the woods and along the Firehole River was an added bonus. Afterwards, we headed back to the Old Faithful area to have lunch at the attractive Old Faithful Inn, which was built in 1903 and at 188,000 square feet, is the largest wood structure in the World. It reminded me just a bit of the High Hampton Inn in Cashiers, NC, except on a much larger scale. Our lunch of Roasted Red Pepper soup with smoked Gouda, Bison Burgers, and Huckleberry ice-cream over crumb cake served near the fireplace was a delight and since it was still gray and rainy upon our finishing, we decided to forego the other sights on our list and head home for a nap. How nice. Here are some of the shots taken during my visit thus far. 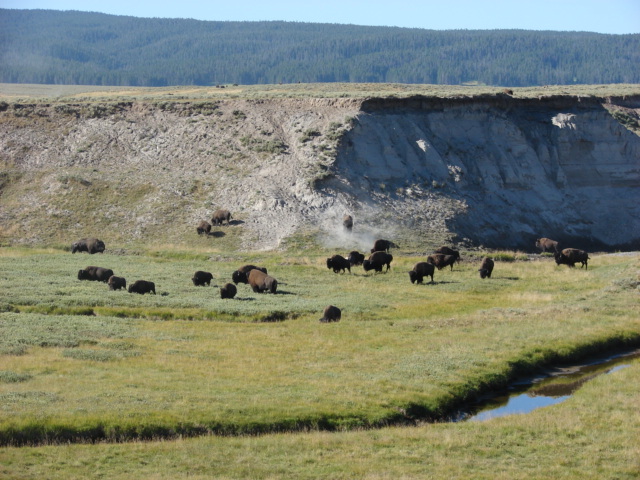 We’ll start with the Bison herd that passes by Dora about twice a day. Please note the nursing calf. These guys pass as close as 4-6 feet from Dora. I have to really look around before letting the dogs out because sometimes they get tired and lie down right there next to me and stay for hours. This is a typical sight when driving the roads here on the East side of the Park. Makes me think of a time before we white folk overran the West. 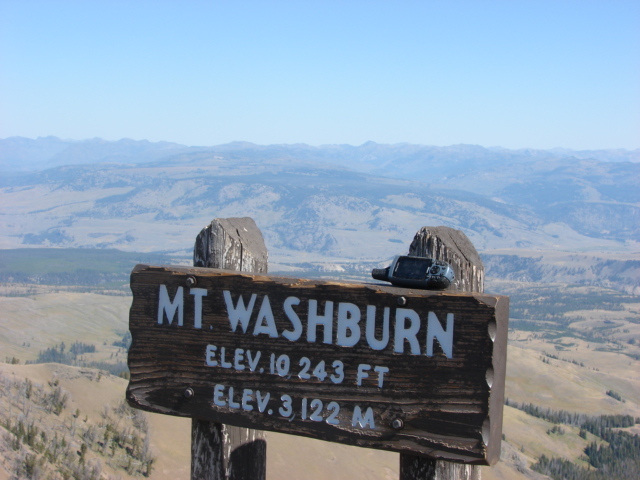 And on to Day One, when I hiked up to the top of Mount Washburn, my first 10,000 footer. Ha! There was supposed to be a herd of Big Horned Sheep near the top, but all I saw was this critter. 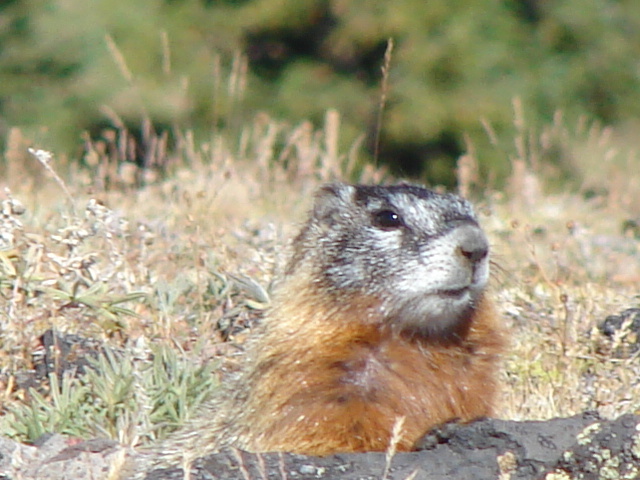 I think he is a Yellow-bellied Marmot, but I haven’t gotten confirmation. Day 2 found me way up in the North end of the Park with an enormous speeding ticket and Mammoth Hot Springs. 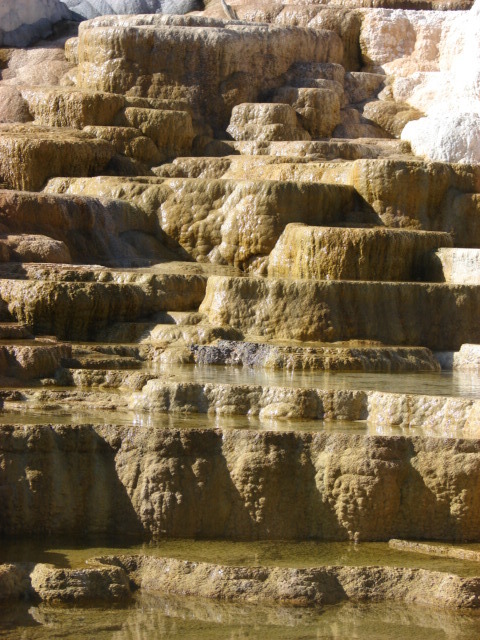 What happens here is the hot water from underground is forced upwards through limestone. 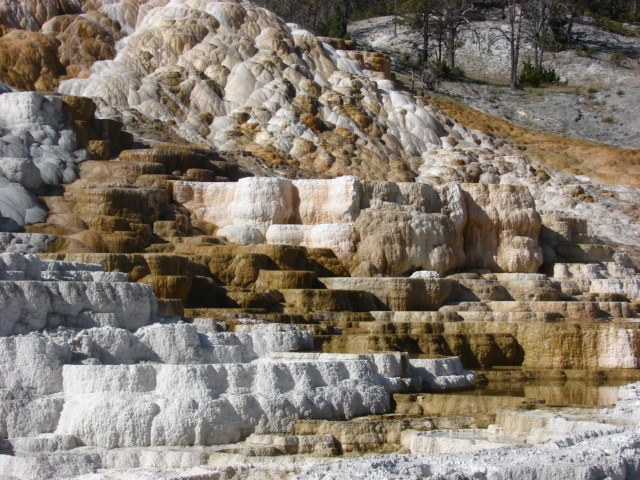 During this process, the water brings calcite up with it and deposits it above ground creating these amazing terraces of hot pools. This area is so active that entire boardwalks can be overtaken in a matter of a few years. The different colors you see are different microorganisms that thrive at different temperature levels. The area in the North end of the Park is almost desert like as you can see from the huge fields of sage brush below. Alright, this is taking too long and daylight is burning on my last day here, so I’m going to stop for now. Will post the rest of the shots later, so stay tuned. 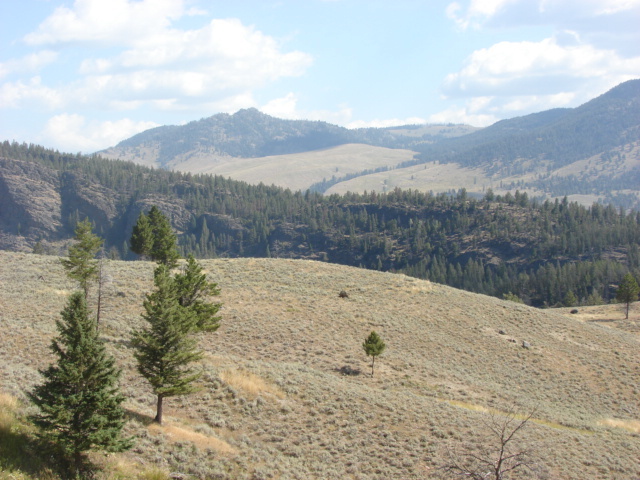 Yellowstone from the Marlboro Ranch. Glad you got such a good hook up after all your other head aches. Cheers !!!! I’m enthralled by your lunch and those microorganisms! Love seeing your blog! Suzanne is here helping me find it and type you this note. I’m really impressed with your adventures. I wouldn’t have been able to do this when I was young – you’re very brave. We’re really looking forward to seeing you in Clyde. I know you’ve been talking to Bill and I’ll call you soon. You are more than welcome to park up here. I would be so thrilled to have you close! Suzanne and I are looking forward to entertaining you. We’ll keep track of your travels but Bunny communicates by phone. Reminds me of 1976, when crossed the US in an old second hand camper– I was teaching elementary school so at every stop I’d be so excited to learn, learn, learn. Today, I recall little but had a ball collecting info, petrified wood samples bought at the park gift store, pine cones of every shape and size imaginable, etc., etc. Your trip is such a fun read, and I’m learning, learning, learning!!! Will we get to see photos of Lone Star erupting? Yummy lunch at Old Faithful Inn—my mouth is still watering. Loved this blog. 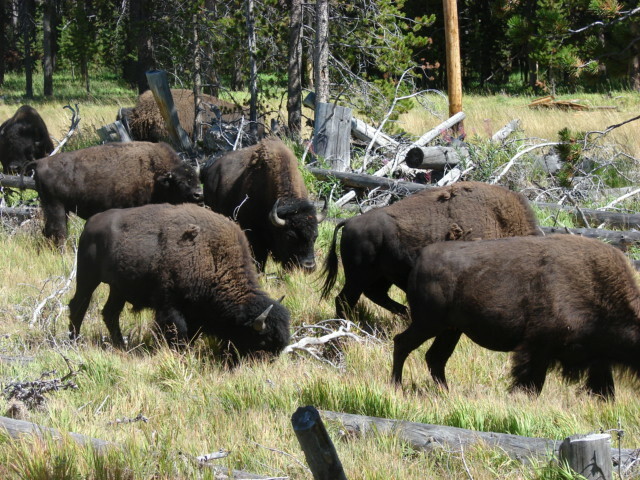 Great pictures of Yellowstone. Looks like you had loads of fun, except for the ticket. On one of our winter trips to Yellowstone Victoria, a friend, and I decided to ski from Old Faithful our to the Biscuit Basin geyser area. We took off our skiis to eat lunch on the trail. While we were eating a herd of bison came out of the nearby river basin and decided to hang out between us and our skiis. Eventually they moved on and we could continue our ski. Hope you enjoy Teton NP! It’s another great park.